Road bike tyres might all look a bit the same to the untrained eye, but they can have a drastic effect on the feel and performance of a bike. They were traditionally divided into racing and training, winter or commuting offerings – with varying amounts of rubber, puncture protection and weight according to their intended purpose. However the advent of wider rims and tyres in road cycling has shaken things up a bit. Deutsche delight courtesy of Continental. Whereas punctures were a fairly regular experience if you were riding 23mm tyres through the summer, let alone the winter, I’ve noticed that they’ve become very rare since I’ve broadened out to 25mm tyres. I know 2mm might not sound like a lot, but the extra volume compared to 23mm tyres is quite significant and – for me – provides a good dose of extra comfort and insurance against minor road blemishes and debris. 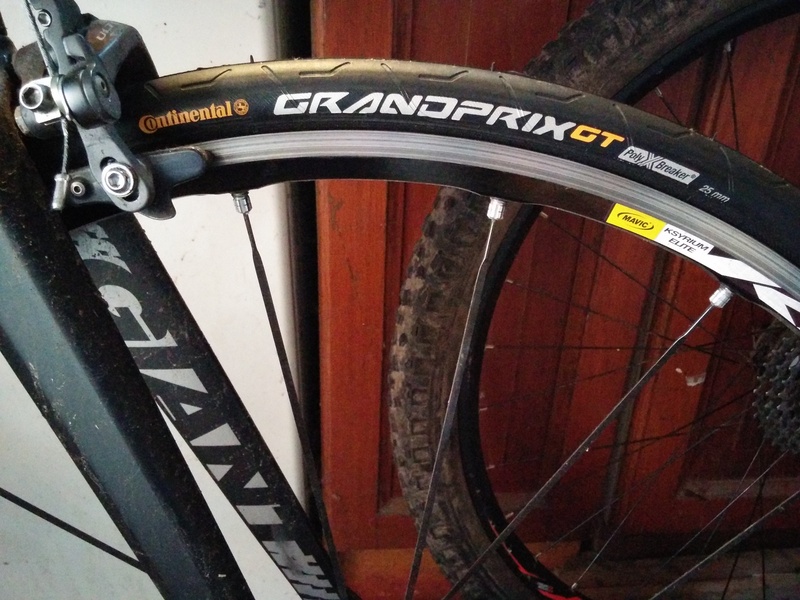 Continental’s Grand Prix GT tyre only comes in 25mm flavour – which is a fine by me for the reasons I just mentioned – and is touted as an all-rounder suitable for sportive riders and general riding. You’ll notice the tyres have the coveted “Handmade in Germany” lettering on the sidewall, which is usually the tell-tale sign that you’ve got one of Continental’s top-quality offerings as opposed to the harder-compound OE tyres that come on many mid-range bikes. I usually choose lightweight race tyres for my “good” bike, with a weight of around 200g – and the GTs tip the scales at 250g. The trade-off for that extra 50g is apparently 50 per cent more sidewall material compared to the standard Grand Prix – and a puncture-resistant membrane under the rubber. Can I really feel the extra weight on the bike? Yes I can, but only just. I started riding the tyres in that warm, dry spell we enjoyed last October and my first impressions were that they had a touch less sensitivity and speed of acceleration compared to my Michelin Pro 4 Service Course – but that this was very marginal. 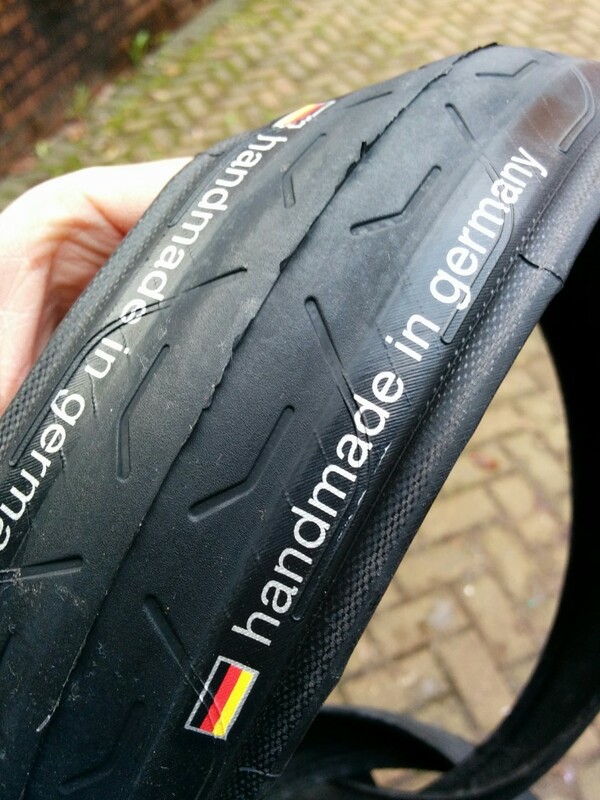 I’ve previously owned a set of Conti’s wire-bead Gatorskins and – for reference – the GTs are much, much closer to the feel and performance of a race tyre. The other area where they comprehensively trump the Gatorskins is grip. I’ve carried on riding them through several months of the wettest weather that I can remember and the worse the conditions have got, the more they have impressed me. I have a devil-may-care attitude about lining up logos and valves. Even when water is flowing down the roads and the tarmac is covered with wet leaves, mud and grit from the fields – the tyres have felt planted and dependable. You probably spotted that the tyres have a shallow tread pattern – but I’m not going to speculate as to whether this may assist in the wet. I do know a good rubber compound when I ride one though – and this one is top notch. I’d be happy to ride these tyres all through the winter – or all year round if I had just one bike. It’s a bit early to report on durability, I got one puncture on my second ride on them – but I may not have checked the pressure for a while before that. Since then they’ve been faultless and I’ll happily fork out for another pair for my winter bike when the time comes.